“My personal style is eclectic, I would say. I always like to mix and match things.". "Uh, but the thing is that it changes every single day. So if I’m feeling आप know a little और rebellious, one दिन I may dress a little और punk rock. 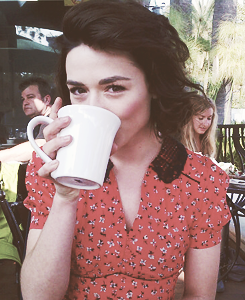 But most of the time I say, pretty consistently, I’m feminine.” - Crystal Reed. Wallpaper and background images in the Crystal Reed club tagged: crystal reed actress. This Crystal Reed photo might contain कॉफी ब्रेक, चाय ब्रेक, and कॉफी तोड़ो. The Cast of TEEN भेड़िया Spill Their On Set Secrets!